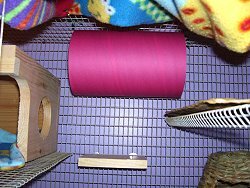 Large cardboard tubes called Chewbular Play Tube or Chub tubes which are 10" x 6" can be used in your chin's cage. I like to drill 2 small holes equally and attach it to the top of the cage using a wire, making sure the wire is pressed firmly to the inside of the tube leaving no gap. Our chins love to run through it and tear at it and some just hang out and sleep in it. The cardboard is made with non toxic glue and food grade coloring is used on the outside of the tube. They are safe for the chin to tear and chew. You can also just set it on the bottom of the cage. 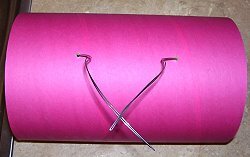 Never give your chin commercial cardboard tubes such as those from carpet rolls, sonatubes, paper towel or toilet paper rolls.